Transformers: robots in disguise. It's one of Hasbro's most prominent franchises, and it has seen multiple iterations, including the recent Michael Bay helmed blockbusters. But now, Transformers goes back to its roots with this partnership between Activision and Platinum Games. 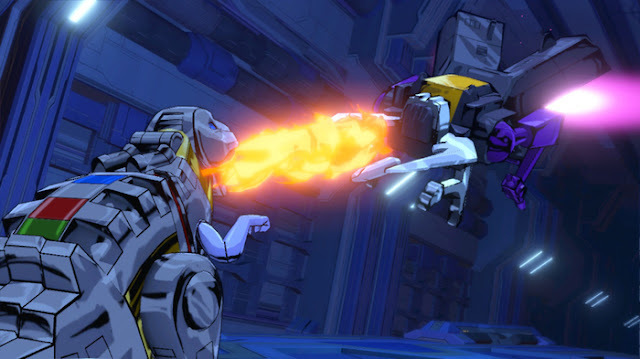 It's Transformers: Devastation, and here's the SuperPhillip Central review. Holy Cybertron, this game is good! I've never been a huge follower of the Transformers franchise (seriously, my only fandom of the franchise growing up was the CG Beast Wars cartoon and its collection of figures), and it over the years went in a direction I didn't care for in the mainstream, a Michael Bay, grim, dark, edgy spectacle starring Shia Lebeouf. Really, the only word in that description that appeals to me is "spectacle". However, now, Activision and Platinum Games are once again working together to not only make another licensed action game (the first was The Legend of Korra), but they're using the version of the Transformers that is much more appealing to me, the cartoon version. Platinum Games has one heck of an impressive resume under its collective belt. They've made creative character action games like Bayonetta and Metal Gear Rising: Revengeance. They've also went for a different route with The Wonderful 101, Vanquish, MadWorld, and Anarchy Reigns. In total, it's an amazing collection of titles developed by the studio. 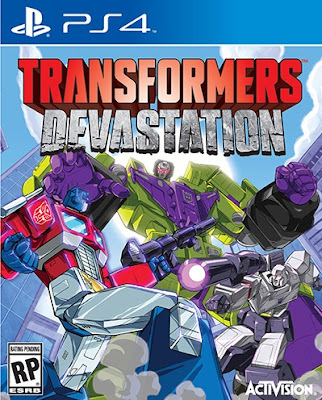 Platinum Games' latest is Transformers: Devastation, and as an outsider to the Transformer franchise, I am impressed, so I can only imagine how exciting this game should be for longtime fans. Time to deconstruct this giant! Transformers: Devastation fits right in with Platinum Games' development philosophy and general structure of its games. For one, each of the seven chapters of the game is split up between multiple missions. Doing well in these missions (i.e. earning enough points through dispatching enemies in a speedy enough amount of time) gives you a certain ranking, with SS being the best. There's a great level of skill involved generally in Platinum Games' titles, and this is a continued trend in Transformers: Devastation. You can't just button mash your way through the game's battles and expect positive results. No, between your onslaughts of weak attacks and strong attacks on enemies, you'll need to do a lot of dodging and evading when a foe winds up its own brand of attack. Here, Bayonetta's Witch Time mechanic fits in well with the Transformers universe. A well timed evasion will slow time down to a crawl for everything except your Autobot of choice. It's at this point that you can get in some nice attacks to knock down an enemy's health bar. Optimus Prime merely wants to axe these enemies a question. 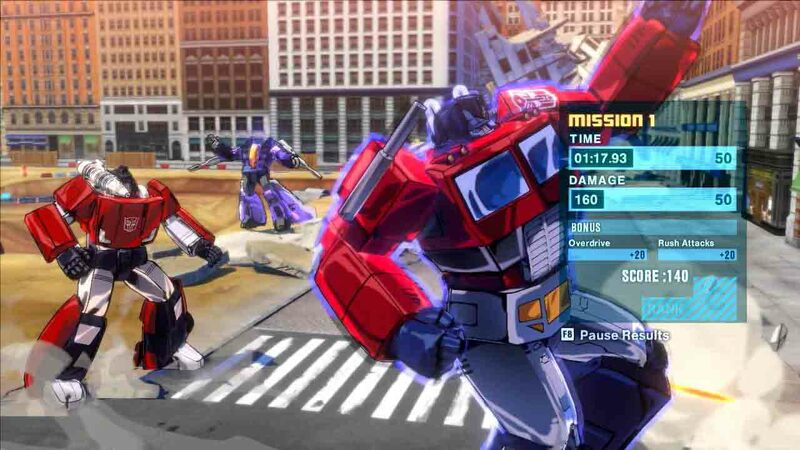 Transformers: Devastation has other mechanics, too, to make for an exciting action game. As in the series, your Autobot can transform into a vehicle at will, quickly transitioning between Autobot and vehicle immediately. Attacking a foe enough with allow you to perform a vehicle attack, turning from your Autobot form into its vehicle form and then slamming into your enemy. You can also speed towards an enemy while in vehicle form and pop up into your Autobot form to perform a rush attack, great for taking out foes with shields or just to take down more health from an enemy than usual. 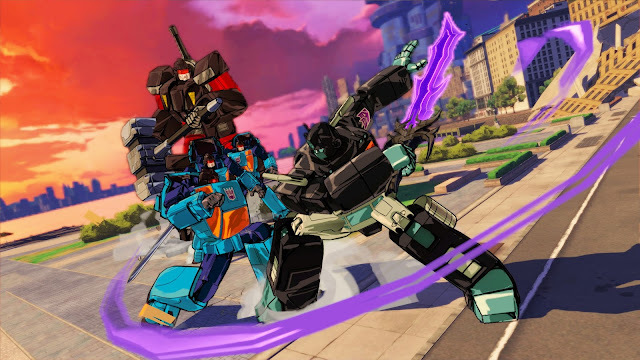 The combat of Devastation has enough variety and challenge that all of the battling you'll be doing against the hordes of Decepticons never feels tedious or tiring. Insecticon? Kill it with fire! Outside of melee attacks, each Autobot comes equipped with ranged weapon possibilities. Whether it's a twin blaster or a sniper rifle for faraway targets, you're never without some formidable weaponry. This is because throughout Devastation, you can gain nice loot in the form of beneficial items and weapons from fallen foes, completing in-game challenges initialized by walking into specific portals, and from treasure chests strewn about the game's levels. The harder the difficulty you're playing, the better the rarity and rank of the weapons you earn. While most of the action in Transformers: Devastation takes place in traditional combat form, there are parts of the game that completely change the rules of how the game is played. This is something that Platinum Games likes to do, such as Bayonetta's flying or bike sections or The Wonderful 101's Punch-Out!! inspired robot battles. It's the same with Transformers, and like those two aforementioned games, these sections do offer gameplay variety, they aren't to the quality of the other gameplay experiences found in the game. I'm talking about things like a side-scrolling chase on a bridge as well as an overhead section where you need to transport explosive Energon to specific part of a level. Choose from one of five Autobots to play as in Devastation's relatively short campaign. 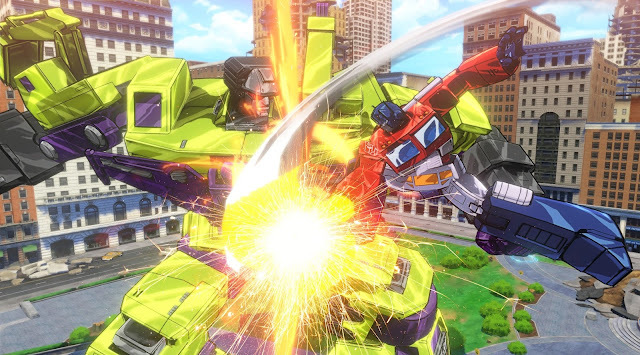 Transformers: Devastation isn't a long game by any stretch of the imagination. To complete its seven chapters will take most players upwards of six hours. As stated, there are multiple difficulties to choose from, where enemies will attack for more damage on higher difficulties. You also have a choice of playing through the game as each of the five Autobots, with each completed playthrough unlocking an achievement or trophy. There is also a host of collectibles to be found in the form of Decepticon flags and spy drones, logs, and little red jumping gnat-like creatures to collect. If that's not enough, there are fifty challenges outside of the story mode to complete; various battle scenarios that pit you against a selection of enemies. 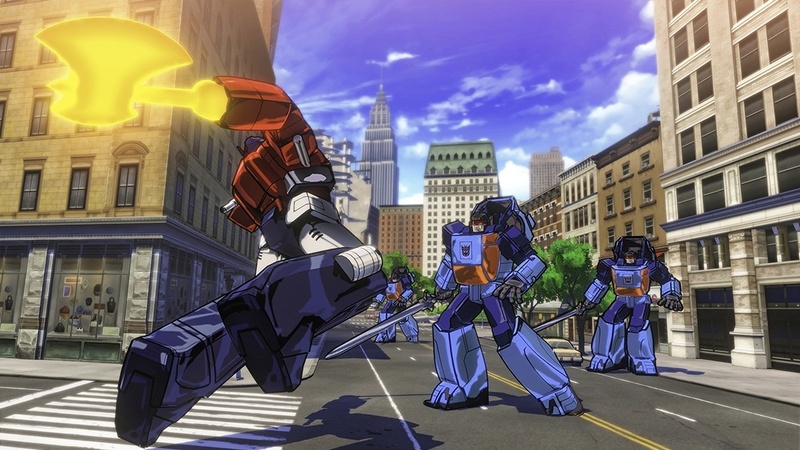 Despite its appearance of being a short game, you can see that there is plenty to accomplish in Transformers: Devastation. Depending on your skill level, your score can give you anywhere between a D and an SS rank. Staying true to its cartoon roots, Transformers: Devastation looks immaculate with its beautiful cel-shaded characters and colorful world. Staying true to its developer roots, Platinum Games has managed to create a game with a frame-rate that is as smooth as fine glass. Devastation successfully emulates the essence of the cartoon, making the whole experience feel like an episode from the show itself. High praise indeed. Meanwhile, the voice actors of the series have come back to reprise their roles, making for an even more authentic Transformers experience. And if you like rock, you'll also like the soundtrack of the game, particularly the ultra cheese (and in a good way) of the ending credits theme. What you get with all of this is something that will truly excite Transformers fans, especially those who have felt jilted by the grittier direction the Hollywood movies went. This is pure Transformers goodness in all of its lighter-hearted cartoon glory. The gameplay is up to the usual excellent standard of Platinum Games, and the amount of time you can spend with the game makes it worth a look for either fans of Transformers, fans of Platinum Games, fans of action games, or fans of robots, vehicles, and/or robots that transform into vehicles.